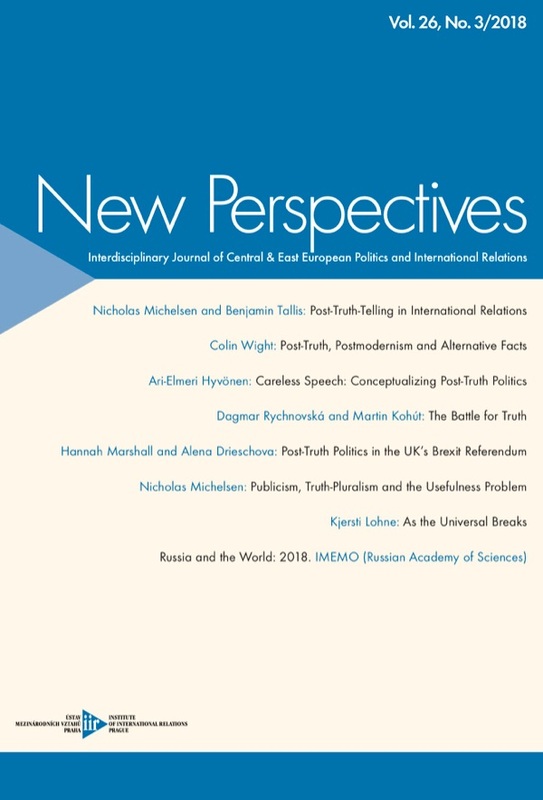 We break new ground in this issue of New Perspectives with an extensive co-edited special section on ‘Post-Truth’ and its relevance for politics and international relations. As Editor-in-Chief, I have been delighted to share the editing duties – and the authorship of the editorial – with Nick Michelsen of Kings College. It’s been a rich and rewarding collaboration that began in a chance conversation back at ISA 2017 in Baltimore, continued with a high-profile roundtable at ISA 2018 in San Francisco, some low-profile drinks at at the wonderful Gordons Wine Bar in London, and now comes to fruition in this issue of the journal. I’m delighted with how this has turned out and to have such a wonderful array of scholarship – and scholars – in the journal. We present post-truth (and its implications) as seen from the various perspectives of Arendtian ethical politics, critical realism, post-universal international justice, trust and the return of agency as well as the history, and future, of IR as a discipline engaged in or disengaged from the (post-truth) world. This is one of the first extended, multi-perspectival academic engagements with post-truth and as well as showcasing cutting edge thinking on this hot topic, it will make a wonderful teaching resource in and beyond IR. It is, therefore, my proud duty as editor of the journal to thank Colin Wight, Kjersti Lohne, Ari-Elmeri Hyvönen, Hannah Marshall and Alena Drieschova, Dagmar Rychnovská and Martin Kohut for their stellar contributions to the special section – and to welcome Nick Michelsen to our Associate Editor team on a permanent basis.